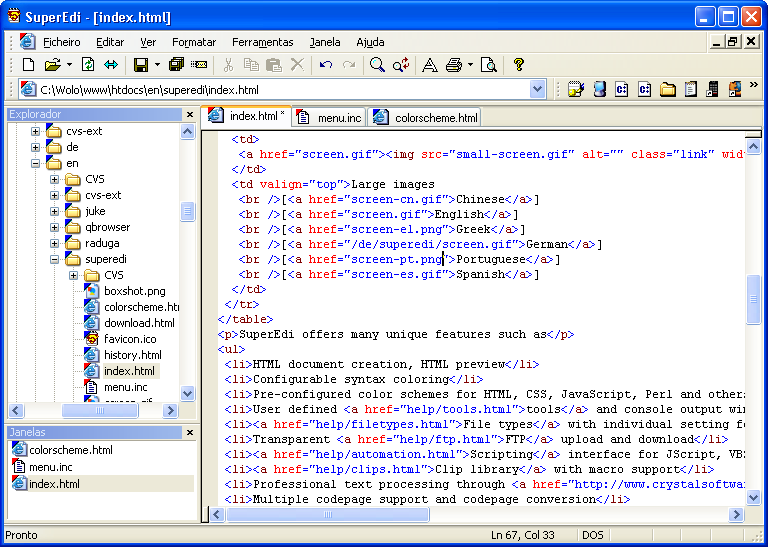 SuperEdi is a text editor with syntax coloring and build-in FTP client. The build-in directory tree helps you locate files quickly without opening the Windows Explorer. Context sensitive information is available via keyword lookup in any Windows help file. 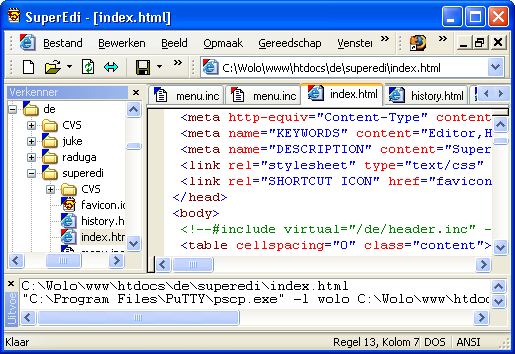 The editor is extendable using executable programs, text clips and automation scripts. SuperEdi supports Unicode UTF-8, UTF-16 as well as many locale- specific encodings. SuperEdi is absolutely free of charge for private as well as for commercial users. There are no advertisements, nags or any other limitations. How can you contribute to SuperEdi? If you want to use SuperEdi in your native language, you can translate the program using the Localization Kit. It contains all resources, instructions and tools to translate SuperEdi and test your translation. When you are finished with the translation, please send me the translated resource file so that it can be included with the next SuperEdi release. If you have made a syntax definition file for another file format, please send me the .syn and optional .col file by e-mail so I can post it on the SuperEdi Downloads page. Also if you have created scripts or add-ins that you would like to share with other SuperEdi users, I can post these on the SuperEdi Downloads page as well. If you have found a bug, please report it using the bug report form. If you think SuperEdi is not famous enough, please recommend it to your colleagues and friends. You can also submit it to freeware and shareware collections using the PAD file. Finally you can use the Message Board to exchange thoughts about SuperEdi with other users. style="border: 0px; width: 88px; height: 31px"